Get ready for the dinosaur experience of a lifetime. Dippy the Dinosaur has embarked on a national tour set to delight young and old. The 70ft-long replica of a diplodocus begins its UK tour on Dorset’s Jurassic coast at The Dorset Country Museum. Families can visit this larger-than-life spectacle from Saturday 10 February 2018 until Monday 7 May 2018. Everyone is welcome. Dippy has been a firm favourite at the National History Museum in London. His toothy grin has welcomed families to this major London attraction for many years. Now, owing to the initiative of the Jurassic Coast Trust, Dippy has been welcomed to the Dorset Country Museum. This will be the last temporary exhibition to be hosted by Dorset County Museum before certain sections of the galleries are closed for a major refurbishment. Transporting Dippy was no easy task. The team worked around the clock to move the huge structure from the London History Museum to Dorset. It then took a further two weeks for the team to reconstruct Dippy – from top to toe. Diplodocus (Dipy) is among the best-known sauropods. The easily identifiable Diplodocus dinosaurs with their long necks and whip-like tails roamed the earth millions of years ago. Their forelimbs were slightly shorter than their hind limbs, resulting in their largely horizontal posture. 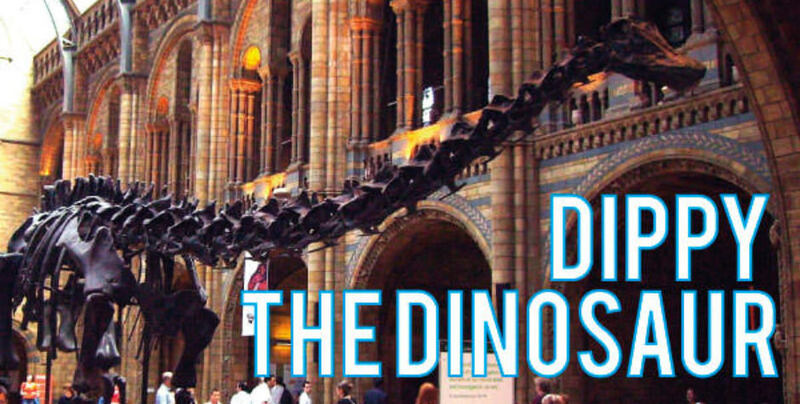 Dippy the dinosaur is the talk of the town, so do not miss out! This is a very popular attraction and we recommend that you plan ahead. Accommodation at this time of year is in high demand. Why not stay at B+B Weymouth and make the most of your visit? B+B Weymouth is perfectly located with quick access routes to all the fun. Contact us today to arrange your booking.